The Lagos State Command have arrested two suspects in connection with robbery attack on popular comedian Basketmouth. On 7/9/2016, the Lagos State Command received a distress call from Mr Bright Okpocha a.k.a Basketmouth that he has been robbed at gunpoint. On 16th November 2016, the command arrested one Chiemele Joseph while carrying out armed robbery operation at ilasa Maja area of the State, his arrest led to the arrest of another gang member Chibuzor who further investigation revealed is the leader of the gang that attacked the comedian. Items recovered from the suspects are one Beretta pistol, two locally made pistol, two AK 47 rifles loaded with ammunitions, 12 live catridges, 2 iron cutters, master keys, 1 Mercedes 4matic Benz jeep. 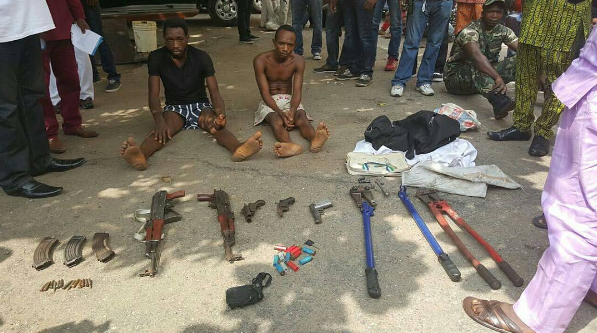 The commissioner of police, CP Fatai Owoseni while parading the suspects , states that the Command will continue to be on the trail of criminals within the state , as he warns them to eschew criminalty or relocate from Lagos. He further reassures the residents of the state that their safety is guaranteed during this festive period. The suspects Chiemezie Joseph and Chibuzor Ugwu will soon be charged to court.